Aimed at a prosperous growth in this domain, we are instrumental in offering an excellent quality range of AC Wall Stand. 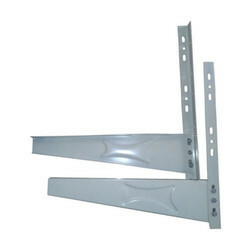 We provide powder coated AC stands for window & split AC. - Designed & built considering operational & aesthetics. - Manufactured with thick high grade steel. - Seven way process Powder Coating FOR Rust Prevention. - Split Ac Out-door stand. - Good design & engineering. We are a reputed entity in the industry, actively engaged in offering an optimum quality range of Split AC Outdoor Unit Stand.